A friend said this to me, but I didn’t look up to see who it was. I was sitting on the floor of a bar, hat partially over face, watching texts from lifelong friends fly in, most echoing the same sentiment: “What did we do to deserve this?” It’s the only thing left to think at this point. It can’t just be the athletes who are at fault. Somehow, the real fans — the diehards who are sprinkled about throughout the transplant-riddled Southern metropolis — have begun to believe this is simply our fate. The “selling our soul for the ’96 Olympics” theory? That’s one. There are others. But ultimately, no one knows. Still on the floor, I searched for the Hawks score just to look for something positive and found the answer that I expected. Miami Heat 92, Atlanta Hawks 87. “But hey, y’all’s WNBA team is in the finals,” said another friend, assumedly half in support, half being a jerk. At this point, people just wanted me to get off the floor. It was 1 a.m. So I looked up the WNBA series. Game 1 took place the previous night. Minnesota Lynx 84, Atlanta Dream 59. One of the realities of being a sports fan is knowing, deep down, how games will end before games even take place. You know the answer, because you’ve spent your entire life watching your teams and you become familiar with their tendencies, sometimes for better, typically for worse. When you’re certain the ending is bad, however, you’ll do anything to counteract those negative assumptions. You talk trash to fans from opposing teams. You engage in verbal scuffles. You become your city’s hype man. And you speak in hyperbole, suggesting the strength of our nation and the resolve of our allies could be endangered should your team somehow lose. But behind it all, you’re sending nervous texts to those who are going through the same thing. This is you “doing your part.” And, over the years, you’ve convinced yourself that if you, non–professional athlete, don’t do your part, then you can’t possibly expect to come out on top. 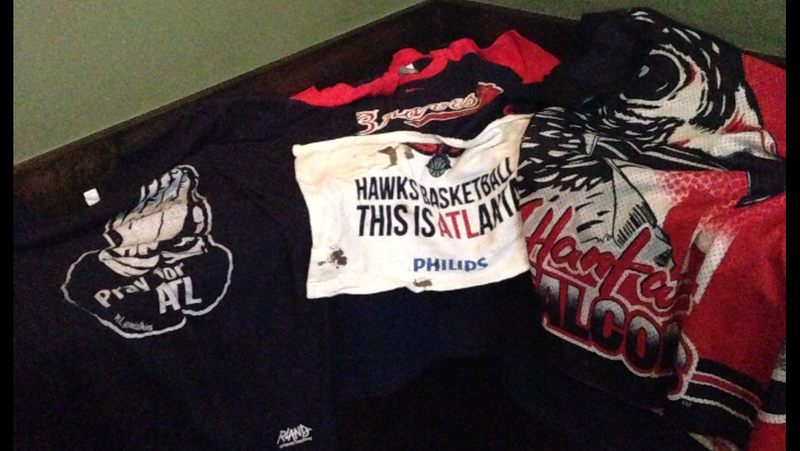 So you bring a pile of Atlanta shirts and jerseys to the bar and set them up like an altar. Sometimes you touch them, other times you fix them so none of the teams’ names are covered up. You don’t know why you’re doing it, but it feels right. The first game of the day featured the 1-3 Atlanta Falcons, very much needing a win to remain in playoff contention, against the New York Jets. And then, an hour later, the Atlanta Braves, facing playoff elimination, started their NLDS game against the Los Angeles Dodgers. Two teams. Two games. Two TVs. One city. When both of your teams find themselves losing early, you’re not scared. Just upset. And anxious, because you know the points and runs will come, ultimately leading to a tie or lead. But you just never know if it’ll be too late. Like many people last night, I stood in a bar, head on a swivel between two games. Rarely staying still for more than 15 seconds, the cycle of my attention went Braves-Drink-Falcons-Waitress-Friend-Braves-Phone–Atlanta Altar–Falcons-Drink-Drink-Braves-Falcons-Friend. After a continuous stream of head shakes and hands atop head, it finally happened. The Braves tied the game, 2-2. A few minutes later, the Jets scored a field goal, but that put them up only by six as the game went into the fourth quarter. It was happening. The plan was working. After more than two hours of stress, real, unmanufactured hope was creeping into my body. Even when the Jets went up two scores, 27-14, I was fine. There were 12 minutes left, and we had Matt Ryan, Julio Jones, and Tony Gonzalez. With eight minutes left in the football game, as the Braves were tied 2-2 in the fifth inning to my left, Jacquizz Rodgers ran for a touchdown on my right — not a little run across the goal line, but a 19-yard rush that almost had me screaming at the top of my lungs. We were down only by six. After a series of favorable calls and one-handed catches that signaled this was our night, the Atlanta Falcons Professional Football Team found itself in the lead, 28-27, with 1:54 left in the game. We did it. Less than two minutes for rookie Geno Smith to get his New York Jets to field goal range? No chance. Like I said, we did it. One-and-three sounded like a horrible record, but 2-3 didn’t seem that bad. That’s only a win away from .500, a percentage that would probably get quite a few teams into the playoffs this year. While this was going through my head, I somehow forgot the final stage of the Atlanta sports plan. There’s losing, then being within striking range, then taking the lead, and then, finally, the reckoning. Somehow, the Jets made it down the field, setting up a 44-yard field goal that went through the uprights, ending the game. It hurt. There’s no way around that. But, if there was any solace, it was that there was a second, arguably more important game still on. The Falcons gear was promptly removed from the altar and thrown on the ground. The Julio Jones jersey on my person was replaced with a Braves shirt. The “Pray for ATL” shirt was still prominently featured, because at this point that was about the only thing you could do. For several innings of the Braves game, we’d been stuck in Stage 2. “Striking distance.” But then in the seventh inning, Elliot Johnson hit a one-out triple. It was clear we were going to score a run. We were going to get the lead. Two minutes later, we had it: 3-2 Braves. The joy was so high, I’d almost forgotten about the Falcons game. Now in the eighth inning, up 3-2, a smile actually crept on my face. And then I said it. I still can’t believe I said it. I lost the game for the Atlanta Braves. It sounds crazy, but I actually believe it. I looked at my friends and said, “If it goes to a fifth game, I think I’m flying home.” I didn’t say “When it goes,” I said “If it goes,” but it doesn’t matter. The damage was done. The Braves lost this game, 4-3. Two seasons ending in one evening, leaving a city with the Hawks to cheer for, meaning these are the darkest of days. The Atlanta altar was now on the ground. I didn’t want to count the Falcons out after this game, but it felt like it was over. But maybe this was the public embarrassment that they needed, a marquee quarterback getting outplayed by a rookie on Monday Night Football. Maybe this would wake them up. Maybe this is the setup for a legendary second half of the football season. All I ask is that whoever breaks the news to @rembert just does it gently. You can’t pick your family and you can’t pick where you’re from. See everyone next year.